Traditionally, linzer cookies (also known as sandwich cookies around our house) are made up of flour, ground nuts, sugar, egg yolks, spices and lemon zest and filled with preserves. Being from Germany, they are one of Kevin’s favorite and rarely saved just for Christmas. 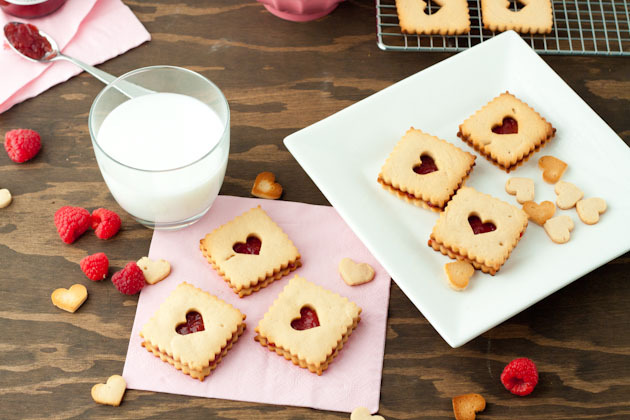 These healthy, vegan, grain-free, linzer cookies have a coconut flour base, converting this otherwise heavy dessert into a light and sinfully delicious raspberry cookie sandwich! Sift almond flour, coconut flour, baking soda and salt in a large bowl. Set aside. In a smaller bowl, mix together oil, honey and vanilla with a hand mixer until combined. Add wet ingredients to dry, and mix with hand mixer until incorporated. Place dough in the center of a large piece of parchment paper and cover with an additional sheet of parchment. Roll out to ? inch thick and place in the freezer for 30 minutes. Remove dough from freezer. 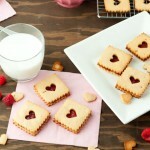 Using a Wilton linzer cookie cutter set, press cookie shapes into dough. You will probably have to bake the cookies in batches as the dough becomes sticky after a couple of minutes. When this happens, place the first batch in the oven for 5 minutes, roll out dough to ? inch thick again and place back in freezer. Remove cookies from oven when just lightly golden edges, no more than 5 minutes. Allow to cool on the parchment paper lined/silicon mat lined cookie sheet for 2 minutes before transferring to a rack to cool. Repeat with remaining dough, freezing for a couple of minutes in between batches. I kept the linzer heart cutouts and baked for 3 minutes once all cookies were done. Once cooled completely, place 1 teaspoon jam on the top of the rectangle pieces and place cutout section over top. Repeat with remaining cookies and enjoy!